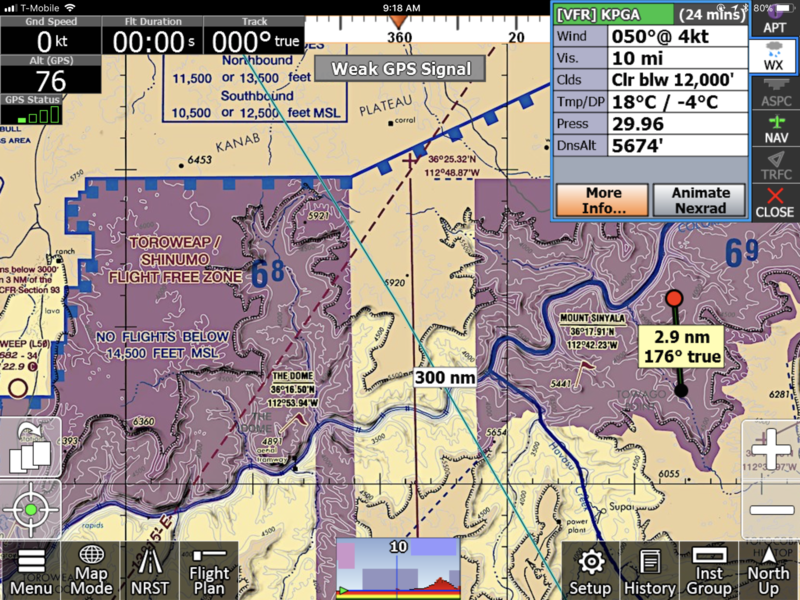 Does anyone know or recall if the GPS shows the Grand Canyon Corridors on the GPS Sectional chart AT ALTITUDE? I am planning a trip and i would have expected these corridors to be clearly marked on the GPS Sectionals but it's not. I remember seeing them last October during the CTLS Fly-in but I was at 11,000 feet and they showed up clearly. Any thoughts or ideas? Grand Canyon (see Grand Canyon VFR map) KPGA round trip is 193 miles 1.7 hrs. Route: KPGA south through Marble Canyon (monitor 120.05) climbing to 10.5K to enter Zuni Corridor @ N36 17.38 / W111 51.04 to exit @ N35 58.33 / W111 53.39. Turn west along south canyon rim climbing to 11.5K to Fossil Corridor. Switch and monitor 127.05. Turn north and enter Fossil Corridor at 11.5K @ N36 16.43 / W112 34.97. Exit Fossil Corridor @ N36 22.87 / W112.18.70 switch back to 120.05. Proceed back to KPGA or tour along the Vermillion Cliff area then back to Page. If you use your Ipad and use the Grand Canyon specific map it will show you the corridors and you can fly right on them..
You can also take your GPS a head of time and mark the corridors as waypoints. Just move the pointer to where the corridor is and mark it and then label it in the menu. I will be using the most western corridor for this trip. I was using my I-FLY GPS unit to plan the trip but these corridors are not marked. You would think that if it was that important, it would be clearly marked. I used the same APP on my Tablet for the CTLS trip last year and it showed us in the corridor but not now so I am thinking it only displays itself while at attitude. Not likely, but that's all I can figure out at this point. Even if i go to SKYVECTOR which uses a "REAL" Sectional, NO corridors are shown. Curious as to "WHY" that is? If I-FLY is similar to ForeFlight on iPad, the additional detail only shows up when you zoom in on the screen, like with the Terminal Area Charts. Yeah, I saw this. I just wish it was displayed on my I-FLY GPS so I could just accurately / pictorially enter it into my flight plan.. Thanks J LANG, that was the fix I was looking for. I KNEW I had seen the corridor on the GPS Before! 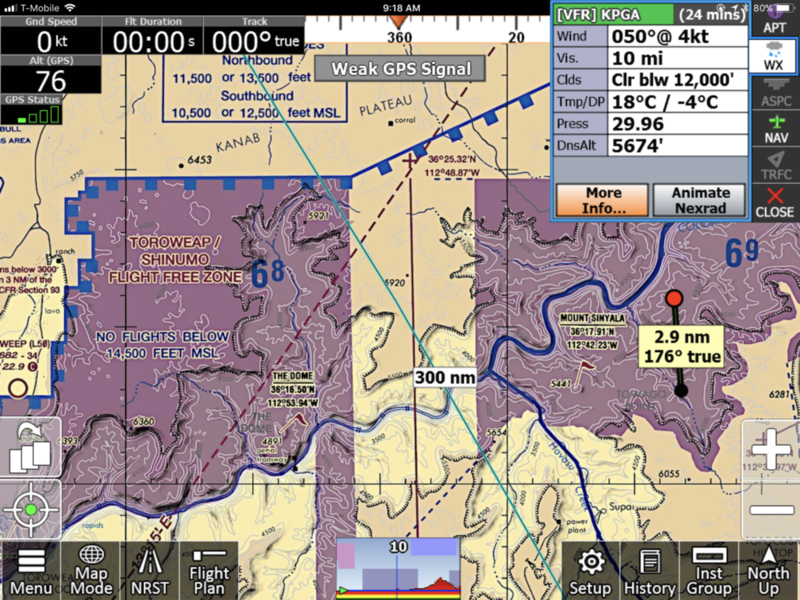 On Skyvector, if you locate over the Grand Canyon it will show a button in the upper right for the Grand Canyon VFR chart which shows the same stuff as the figure above here in Foreflight. Cheers. I fly allows you to pick the chart you want to use too. It's this button: along the lower left side in the image provided by rtk above. Normally, iFly picks the chart that makes the most sense for the zoom setting you have selected. If you are zoomed way out it picks the World Aeronautic Chart (WAC - 1:1,000,000 scale). If you are zoomed way in it chooses the Terminal Area Chart (TAC - 1:250.000 scale). In between. of course. It picks sectional charts (1:500,000 scale). This insures the text is not too small to read or absurdly large. But to a limited degree, it also allows you to override its selection. That's where the chart selection button shown above comes in. This button also allows you to see the legends on the charts, if desired, or the VFR routing on the back of some terminal area charts. 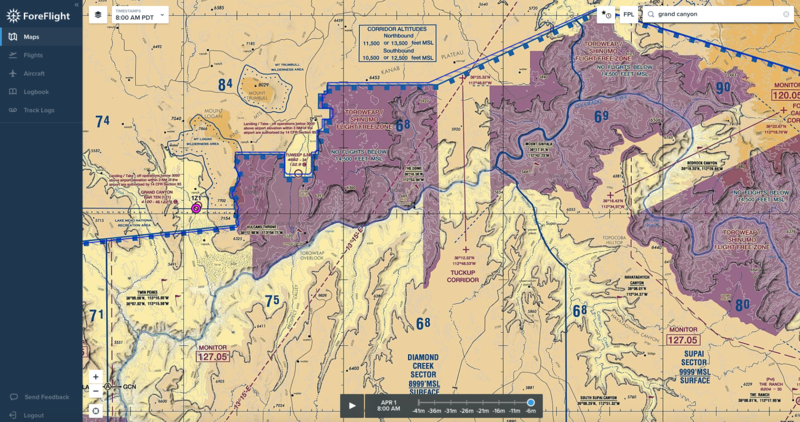 Note that the Grand Canyon Special Flight Rules Area chart is labeled as a TAC chart even though it does not include a class Bravo air terminal. It just happens to be the same scale so iFly calls it a TAC for convenience. it actually shows up on the IFLY GPS if you ZOOM in pretty tight.